I am aware that I haven't been talking about crafting much lately. I have a confession, it's because I'm doing a test knit. I love it so much I am ONLY working on the test knit. Unfortunately I'm not allowed to talk about it or show pictures to you for a while yet. When the designer gives me permission, you can be sure that I will share with you, because it is a great design. However, as I was really tired, after a poor night's sleep, and in a mood for plain garter stitch I decided that instead of knitting on of my other straight forward patterns, I would start another! I decided that I would cast on the Hansel by Gudrun Johnston, otherwise known as The Shetland Trader. 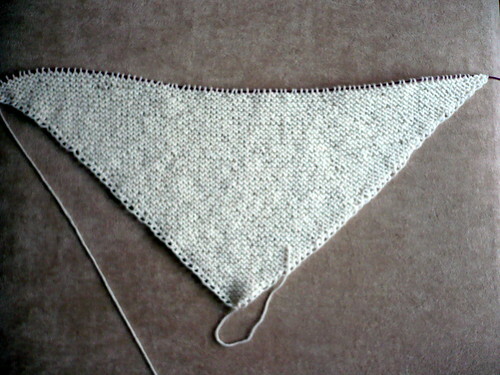 I have wanted to knit a Hap type shawl for a long time, really since I first heard of them. I just love the simple and elegant design. I am interested in looking at more Shetland type of designs, but I never seem to find the time to do the research, so until I do Gudrun will have to keep designing pretty things for me to knit! I have actually knit something of hers before, Aestlight. 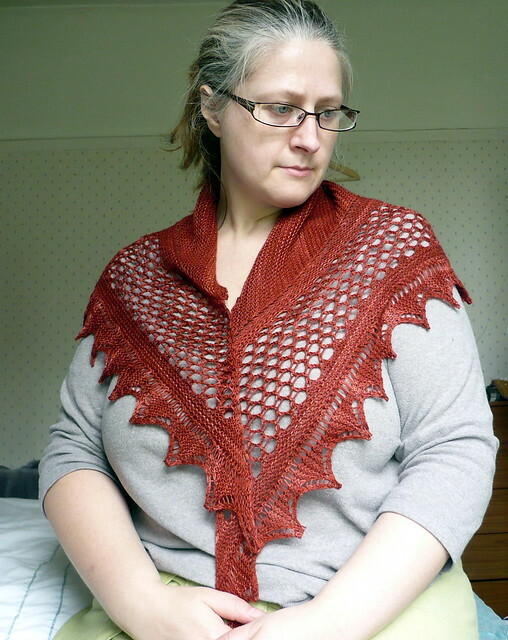 One of the things I loved about this pattern was the stretchiness of the top edge and that is done by starting the shawl kind of in the middle, which is how the Hansel also starts. It is a blanket, or it can be used a shawl. The centre part is knit in a square in garter stitch, starting from one corner and increasing at the start of each row by doing a yarn over. This creates a series of loops at each edge of the square as you knit. These loops mean you can pick up around the edge incredibly easily, and the join will be nice and stretchy. I only cast this on a few hours ago. It has grown really quickly. 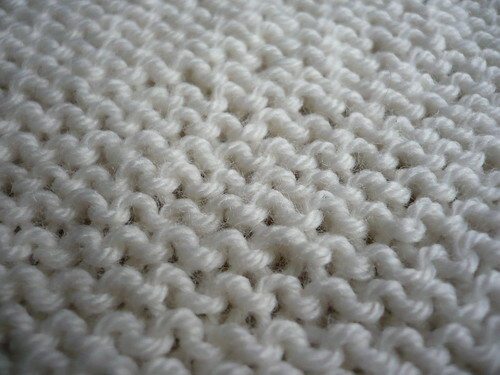 I do love the soothing and healing nature of garter stitch. Ooooh the squishy goodness. This is particularly squishy as it is a lovely soft baby type yarn, Katia Dolce Merino, which is 50% Merino and 50% Acrylic. This almost has the softness of the lovely Malabrigo Sock that I knit the Aestlight in, but it is machine washable. There is something about the combination of merino and garter stitch that just makes me melt. As you may have guessed, this is a baby knit. 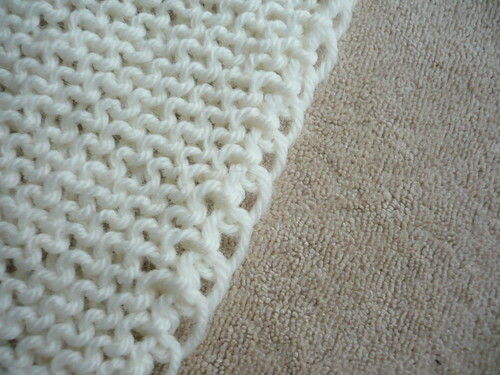 I think I will knit this entirely in cream, rather than adding colour on the edging as is suggested in the pattern. I think the cream will be quite sophisticated and neutral so the recipient can either use it as a blanket for the baby, whatever the gender, or as a shawl for herself when she is sitting up in the middle of the night feeding the little one. I think this will be a nice fun knit, that will hopefully be well received. To look at other folk's knitting and crocheting projects go and take a gander at Tami's blog, by clicking the button below. It's worth a look to see all the lovely things that are around that you will covet!